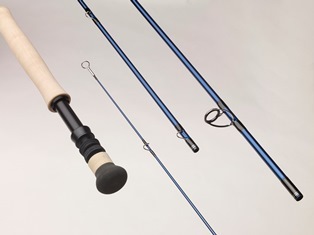 Sage has announced a new series of saltwater rods for the demand of high performance. The fast-loading “SALT” will be available in 12 models ranging from five through 16-weights beginning in August 2014. Bainbridge Island, Wash. (June 12, 2014)–The team at Sage understands the kind of intense pressure saltwater fishing puts on fly rod performance. This fall, to meet the incredibly diverse range of casting demands in saltwater angling, Sage introduces the SALT. Available in 12 models ranging from five through 16-weights, the SALT uses a fast-loading, salt action blank in dark sapphire with black thread wraps and silver trim wraps. The oversized Fuji ceramic stripper guides and hard chromed snake guides and tip top ensure this rod performs. The heavy-duty stealth black anodized aluminum up-locking reel seat creates a solid nest for the reel, and the hidden hook keeper in the reel seat keeps things sleek. The super full-wells cork handle offers a positive grip in tough fishing conditions. The SALT comes in a black rod back with electric blue logo and model tag in a matching electric blue powder-coated aluminum rod tube with Sage medallion. The Sage SALT will be available at retail in August 2014 for a retail price of $850. Founded in 1980, Sage was created with one idea in mind—to build the world’s finest performance fly rods. Passionate about creating fly fishing products that continually exceed expectations, Sage strives to seek performance advantages through new materials and designs based on a foundation of research and innovation. Sage also offers fly reels, fly lines, apparel, accessories and luggage for avid anglers. For more information, please visit www.sageflyfish.com Connect with us on Facebook, Twitter, Google+ and Vimeo.